Installing a Ground Fault Circuit Interrupter. What is a Ground Fault Circuit Interrupters? A Ground Fault Circuit Interrupter (GFCI) is an electrical devices that is either installed in your electrical system or wired into a power cord to protect from electrical shock. A GFCI constantly monitors current flowing through a circuit. 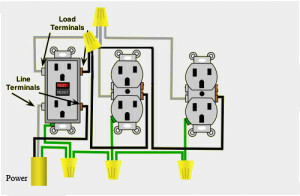 If the current flowing into the circuit differs from the returning current, the GFCI interrupts power. Ground fault protection is integrated into GFCI receptacles and GFCI circuit breakers for installation into your electrical system, especially for circuit outlets in vulnerable areas such as where electrical equipment is near water. 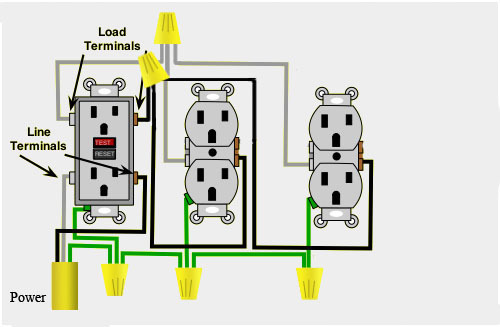 Where Ground Fault Circuit Interrupters Should Be Installed. In homes built to comply with the National Electrical Code, GFCI protection is required for most outdoor receptacles, bathroom receptacle circuits, garage wall outlets, kitchen receptacles, and all receptacles in crawl spaces and unfinished basements. Homeowners that do not have GFCls installed in all those critical areas specified in the latest version of the Code should consider having them installed. For broad protection, GFCI circuit breakers may be added in many panels of older homes to replace ordinary circuit breaker. For homes protected by fuses, you are limited to receptacle or portable-type GFCIs . Ground Fault Circuit Interrupter Installation. Circuit breaker and receptacle-type GFCIs should be installed in your home by a qualified electrician. Receptacle-type GFCIs may be installed by knowledgeable consumers familiar with electrical wiring practices. When in doubt about the proper procedure, contact a qualified electrician. All GFCIs should be tested once a month to make sure they are working properly. To test the receptacle GFCI, first plug a night light or lamp into the outlet. The light should be on. Then, press the “TEST” button on the GFCI. The GFCI’s “RESET” button should pop out, and the light should go out. If the “RESET” button pops out but the light does not go out, the GFCI has been improperly wired. Contact an electrician to correct the wiring errors. If the GFCI is functioning properly, and the light goes out, press the “RESET” button to restore power to the outlet. Put your electrical worries to rest! Leave your electrical services work to the professionals. For all of your residential electrical needs, give us a call – we’re here to help. Call today to request a free job consultation. For a great deal, call master electrician and Martin County electrical contractor Glenn Goodiel. In Martin County, Goodiel Electric, LLC. services Hobe Sound, Indiantown, Jensen Beach, Jupiter Island, North River Shores, Ocean Breeze Park, Palm City, Port Salerno, Rio, Sewalls Point and Stuart. In St. Lucie County, Goodiel Electric, LLC. services Port St. Lucie, St. Lucie West, Tradition, Torino, Tesoro, Lake Charles, Lake Forest, Magnolia Lakes, PGA Village, The Vineyards, St James Golf Club, The Cascades, Fort Pierce, and the unincorporated areas of St. Lucie County.